You look so small ’cause you’re so far. Your twinkle’s just an optical illusion. spreading light and heat so far. and I know I’m made of stars. In 1939, the German/American astrophysicist Hans Bethe proposed the solar fusion model we still use today. There are different branches in the model, depending on the mass of the star. 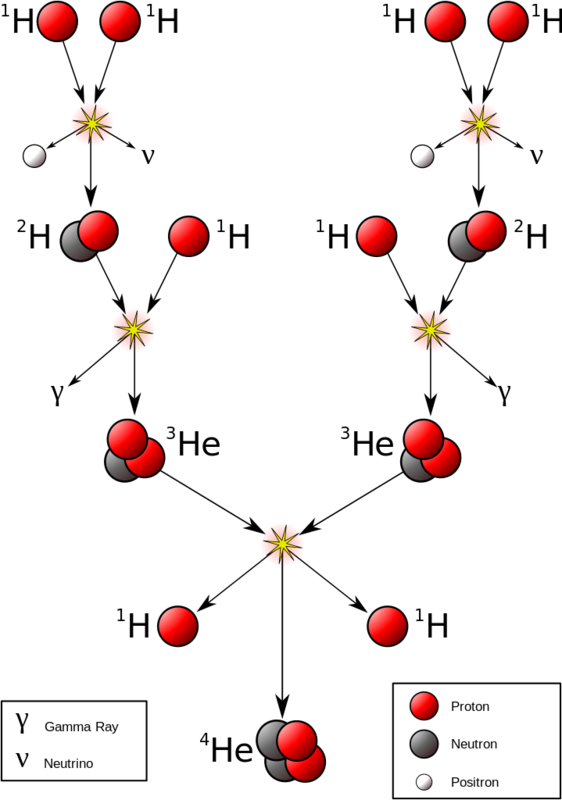 Each has its own slightly different route to create helium from protons, releasing different quantities of energy in the process. Bethe won the 1967 Nobel Prize for Physics; here is a summary of his work and a copy of the Nobel Prize award ceremony speech. Bethe worked on the Manhatten Project at Los Alamos during World War II. He later campaigned alongside Albert Einstein for an end to nuclear weapons. The fusion process in our Sun is called proton-proton fusion and the three stages you need to know for this course are outlined in the diagram below. This video describes the full pp chain process.